Don't let subpar cable organization affect your productivity with Wire Grommets by UPLIFT Desk. Enjoy work at a height adjustable desk without the mess with these handy desk grommets. These are installed at the back of your desk and feature a rotating cover that opens and closes when you need it. Wire grommets come in your choice of black, white, and gray color options to let you build the complementary desk that suits your space ideally. Should I get wire grommets or power grommets? 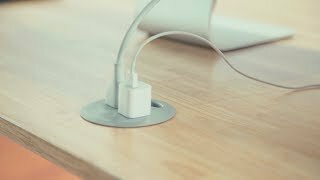 If you don't want to see a mess of unsightly cords hanging off of the back of your desk, then you would probably be happiest with an UPLIFT Desk Wire Grommet. If you are constantly reaching under your desk to plug something in, then you would benefit more from an UPLIFT Desk Power Grommet. Or order one of each to get the best of both worlds. My UPLIFT Desk came with wire grommets, are these any different? Your UPLIFT Desk probably came with black wire grommets. These are the same grommet inserts, just sold separately and available in white or gray as well! What size grommet holes is this compatible with? This is compatible with grommet holes that are 80mm in diameter. Can I add these to a desktop without grommet holes? You will have to drill a grommet hole, measuring 80mm in diameter, into your desktop. Before you drill into your desk, please be certain that the desktop material is substantial enough to support grommet holes without compromising its structural integrity. Do I need a wire grommet? If your desk came with an 80mm grommet hole, then you would benefit from adding an UPLIFT Desk Wire Grommet. The wire grommet is a plastic insert that fits into a pre-drilled grommet hole. It has a movable tab that can be opened to allow wires to be passed through. UPLIFT Desk Wire Grommets are an integral component of ultimate desk organization. How many grommet inserts does this include? If you order an UPLIFT Desk Wire Grommet you will receive one wire grommet insert. If your desk has two grommet holes, you will need to order two of these.